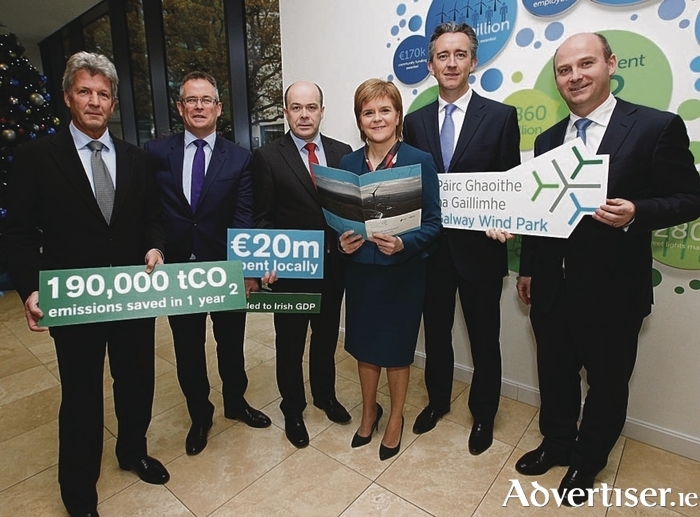 Pictured at the launch were (l-r) SSE Ireland chairman Mark Ennis, SSE plc finance director Gregor Alexander, Denis Naughten, Minister for Communications, Climate Action and Environment, First Minister of Scotland, Nicola Sturgeon, Fergal Leamy, Coillte CEO and Stephen Wheeler, SSE Ireland managing director. Picture Conor McCabe Photography. First Minister of Scotland Nicola Sturgeon visited the Irish headquarters of leading energy provider SSE plc this week to unveil a report which shows that Galway Wind Park near Oughterard has already contributed €88.7m to Irish Gross Domestic Product (GDP ). The 169MW project is being jointly delivered by Scotland-based SSE and Coillte, Ireland’s state commercial forestry company, and is the largest of its kind currently under construction in Ireland. When completed in late 2017, it will be the country’s largest onshore wind farm, contributing significantly to Ireland’s 2020 target of producing 40 per cent of electricity from renewable sources. Galway Wind Park is a 169MW wind farm being developed by joint venture partners SSE and Coillte. Phase 1 (64MW ), which entered construction in February 2015, is owned and financed by SSE while Phase 2 (105MW ) is a 50/50 joint venture between the two companies. When completed in late 2017, it will be the largest onshore wind farm in Ireland, with the capacity to generate enough green energy to power around 89,000 homes, equivalent to almost 80% of the homes in Co. Galway. The First Minister was joined by the Irish Minister for Communications, Climate Action and Environment, Denis Naughten, to launch the new ‘Galway Wind Park Sustainability Impact Report’. The report outlines the valuable economic, environmental and social impacts the development of the wind energy site is delivering locally and nationally through this Scottish-Irish partnership. In addition to its GDP contribution, construction of Galway Wind Park is so far responsible for supporting 1,657 years of full-time employment in Ireland. Regionally, more than 100 local businesses have provided products and services to the project, representing a €20m spend with the local supply chain in Co. Galway. The report also shows that at peak construction 63 per cent of all civil contract workers and 43 per cent of all grid connection contract workers lived within 30km of the site. Nicola Sturgeon, First Minister of Scotland, said that the Galway Wind Park project and SSE’s expansion in Ireland is a fantastic demonstration of the strong collaboration between Scottish and Irish enterprises. “Today’s report shows the impact that this development is having, both in terms of creating jobs and generating sustainable energy. I’m delighted that a Scottish company is behind this. “Through our innovation and investment hub which opened in Dublin last year, we aim to further develop initiatives like this. A number of new Scottish investment wins have been landed this year and through the strong network the hub continues to develop with Irish-based investors, further projects are in the pipeline. Denis Naughten, Minister for Communications, Climate Action and Environment, said it is essential that we all continue to fully engage in measures to control our greenhouse gas emissions. First Minister Sturgeon and Minister Naughten were accompanied for the launch by SSE plc Finance Director, Gregor Alexander, and Coillte Chief Executive Officer, Fergal Leamy. Fancy yourself as a soap siren? Page generated in 0.2231 seconds.